Glad to know you are coming along OK, you sound in better spirits, which is the main thing, & a good indication of improvement, especially having ideas of a new car & going places - thats wonderful. Pleased to know too that you have quit taking medicines, they are alright for a while for the purpose of relief, but to continue taking them is'nt good & its best to let nature take its course. Baths & massages can't hurt you, but medicines can eventually become dangerous to parts of the system it was'nt intended for. I experienced that in Paris, I got over my operation Ok, but suffered a great deal more later due to the conglomeration of pills & shots they gave me to help the original trouble. I ended up having a chronic dysentry for nine straight months, then I had to take more medicines to cure that. I think probably my whole system was poisoned & became one of the reasons for my stroke. Note re your new glasses, I had a pair of tri-focals but could'nt get used to them, made me nervous too, thought I was taking bows every minute, finally had to get straight reading glasses. Glad you caught "Our Relations" & enjoyed seeing it again, even tho' there was quite a bit cut [out] of it & a bit difficult to follow on account of the eliminations, I got a kick seeing you, Daphne & Jimmy Finlayson. A few of the cast passed away since then, Finlayson, Alan Hale, Arthur Houseman, (the drunk) Jimmy Morton (the bartender) & the chap that played the Captain (he later did the Charlie Chan series) also the cameraman Art Lloyd. Do'nt blame you for not seeing the L&H midnight shows, can't understand why they run them that hour of the night, they are not any good anyway, all cut to pieces, just an excuse to get in a lot of commercials. Thanks for the short story, have'nt read it yet. Did anything materialise with your Kiddies stories idea?. How's Jayne's eye trouble coming along, did he have the operation yet? please give him my best. I sure wish your accident suit will be successful Betty, do'nt think 50,000. is asking too much in your case, especially in the fact you were entirely blameless & he admitting it was all his fault. After all its the insurance Co. that will have to settle & they can certainly afford an amount like that, if it was the guy that had to pay it would be another matter, he probably would never have that much money. No matter what you get, it wo'nt make up for all [the] pain & stress you've gone through. Think thats all for now, Eda joins in every good wish. Hope you're coming along good and making headway in your plans - will look forward to hearing some good news re the Miami property deal real soon. 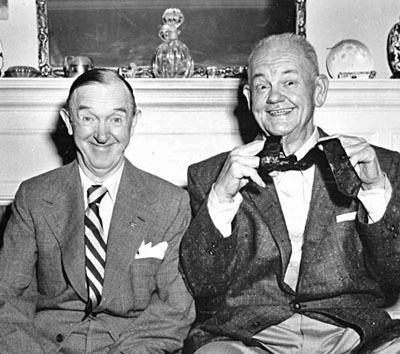 The veteran laugh-getting team of Laurel and Hardy has suffered physical setbacks, but the comedians are planning a film return to cash in on their immense TV popularity. For 30 years, the gaunt, sad-eyed Englishman and his rotund, slow-burning companion have delighted audiences with their slapstick antics. In recent years, reissue of old films on TV has brought them their greatest popularity. Unfortunately, they have been unable to profit from their renewed fame. They get nothing for the constant televising of their old films, made for a flat salary in the days before actors were hep to percentage deals. Illness has kept them from going ahead with come-back offers. They lead quiet lives in modest homes 20 miles apart, seldom seeing each other but keeping in touch by telephone. Oliver Hardy, the big one, lives on a busy street in Van Nuys in the heart of the San Fernando Valley. His fans might have difficulty recognizing him these days. His hair is thin and gray, and his multitude of chins has diminished. “Yea, I’ve lost 150 pounds,” he remarked as he seated himself in his study. “I got pneumonia when we were touring England two years ago. My heart was jumping around a bit, and I got asthma too. When I got back here, I went to the hospital for a checkup, and the doctors told me I should lose weight. “My wife. who’s a good taskmaster, kept me on a strict salt-free diet with a limit of calories. No, I didn’t miss eating. I never really was a tremendous enter. It was the drinking. I drank a lot of beer, and always there were guys around Lakeside golf course asking you to have a drink. I did it not because I liked the stuff, but because it seemed friendly. Hardy, who is 64, said they had been unable to resume work because his partner—the thin one—suffered a stroke a year ago. 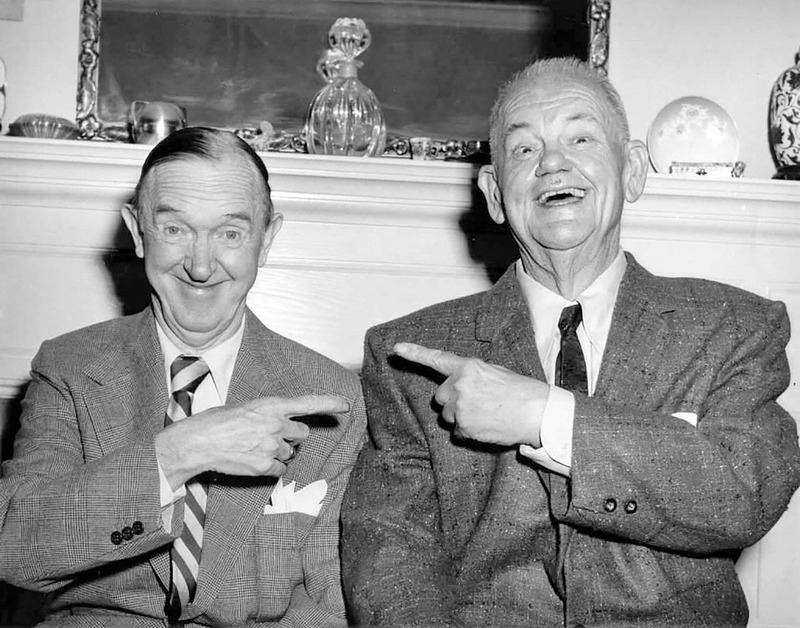 Stan Laurel, the slim one, lives in Santa Monica with his fourth wife. Although he has been seriously ill, he was able to laugh about his condition. Former comic great Stan Laurel and actor Raymond Burr have been dropping in at different times recently for dinner at Jack's Corsican Room, 5459 E. 2nd St., Naples. Laurel, looking a little older than he does in those still-hilarious old comedies on TV, absolutely raves about the quality of Jack's $2.95 prime rib an jus dinner.